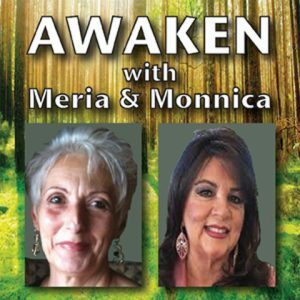 3/20/18 Awaken with Meria and Monnica. Todays topic is past lives. the frequencies hitting all of us now;releasing old emotional issues that express in illness; is it now or then? color therapy;moving water;releasing techniques;past lives and phobias;imprinting;bleedovers;clues to past lives;how to observe without emotional attachment;future life progressions;always in 2 places at once;parallel lives;FEAR-false evidence appearing real;”Today I choose to love”; healing your present through your past;good vs. evil; life purposes and early deaths explained. 2 Responses to "Awaken with Meria and Monnica"
Thank you for another amazing “Meria and Monnica”! Since I’ve been traveling, I haven’t been on the computer a lot in the past 2 weeks. Luckily, I made it back home in time to listen to this show. As far as Past Life Regressions go, I do absolutely believe that they help to understand phobias, fears, etc. in our present life. For as far back as I can remember, I have NEVER liked anything around my neck. I even cut labels off everything. (When I was young, my Mother just went along with it.) Turtle Necks…FORGET IT! I found out that I was beheaded in a past life for being a Witch. It helps to know the reason for this, and to understand it better. I still don’t like anything tight around my neck, but now I know why. Listening to you two together is not only fun and a pleasure, but informative and interesting. Big hug to you both! thank you! I too can’t have anything close on my neck (hung many times I figure). My birthmark at the back of my neck is also an indication.